Jason Evanish came up with the idea to launch Greenhorn Connect while attending the Mass Technology Leadership Council (MassTLC) unConference in Boston in October 2009. The unconference (a participant-driven meeting) is an event for newcomers to veterans involved throughout the Boston entrepreneurial community to join together, share ideas and improve the Boston startup scene. In a session called “Turbocharging the Culture in Massachusetts,” the panelists, Tim Rowe, founder of the Cambridge Innovation Center, and Scott Kirsner, a Boston Globe reporter, led a discussion on how to make the Boston entrepreneurship ecosystem stronger. The panelists and audience members were surprised by his announcement, but offered to support Evanish with his project—if he could launch the site by the following week. Evanish, who was studying for his Master’s in Technical Entrepreneurship at Northeastern University, immediately got the ball rolling, teaming up with his friend Ashkan Afkhami, also a Northeastern student (making up the second half of the “we’re” Evanish had promised would create the site). Together, the pair began producing what would come to be known as Greenhorn Connect. Previously, Afkhami and Evanish had teamed up to create a wiki, or an online collaboration space, to figure out what was going on within the Boston entrepreneurial ecosystem, a system that remained confusing to many entrepreneurs. The wiki listed and categorized events happening in Boston for entrepreneurs and individuals interested in the startup community in attempts to make the system less confusing for entrepreneurs. The final product of Greenhorn Connect evolved out of this wiki, becoming a full-scale website available to the public. Greenhorn Connect launched on Oct. 13, 2009, and has been expanding based on the entrepreneurial community’s needs ever since, Evanish said. Though Afkhami has since left Greenhorn to concentrate fully on his own startup company MobiquityInc, a mobile computing professional services firm based in Boston, Evanish has continued to work on Greenhorn Connect in addition to his fulltime job. He also recruited more members for the Greenhorn team, bringing both Ian Stanczyk as product manager and Pardees Safizadeh as social media director for the site. DemoCamp Boston, a showcase of startup companies, is just one of the many events listed on the Greenhorn Connect Event Calendar. Click the image to see more photos from the event. The website consists of resources and news for entrepreneurs, a job board for startup companies and those seeking positions within startup companies, and an event listings board that describes what events are going on in the Boston community each month, accompanied by a summary each week highlighting the most valuable events individuals can go to each week. Events pertaining to the interests of entrepreneurs such as DemoCamp Boston, which is a showcase of new startup companies in the Boston area, are common on the event calendar. The name ‘Greenhorn Connect’ was coined after the same info session Evanish attended at the MassTLC unConference that led to the idea for the website. “[The panelists] made a list of things that entrepreneurs needed to do better in our ecosystem, and one thing was ‘Take more chances on greenhorns,’” Evanish said. After looking up the definition of ‘greenhorn,’ which essentially means a newcomer, Evanish realized it made perfect sense as a name for the site. Today, the Greenhorn team is trying to foster a sense of community in Boston through the website, pushing information out through Twitter and Facebook daily, Safizadeh said. Going to all these events is particularly challenging, because all member of the Greenhorn Team have fulltime jobs—at startups other than Greenhorn. Evanish works at oneforty, a social business software company located in Cambridge. Safizadeh works as an account manager at Harron and Associates, a non-profit public relations firm in Boston, and Stanczyk is in the process of building a new product within the social fundraising space. To juggle their full-time jobs, social life and responsibilities with Greenhorn Connect, the team members do a lot of work individually after their day jobs are over, and try to meet once at least once a month, Safizadeh said. Michael Champion, vice president of engineering at oneforty, said the job board on Greenhorn Connect is unique and one of the website’s best features because it gives applicants an idea of what the actual company culture is like. As for future plans, Evanish hopes to monetize the job board featured on the Greenhorn Connect website, which has been a free feature in the past, as well to increase usability of the site and make it easier for visitors to comment, using their Twitter, Google or Facebook accounts to log in. To learn more about Greenhorn Connect, visit www.greenhornconnect.com. Jason Evanish came up with the idea to launch Greenhorn Connect while attending the Mass Technology Leadership Council (MassTLC) unConference in Boston in October 2009, a conference for newcomers to veterans involved throughout the Boston entrepreneurial community. In a session called “Turbocharging the Culture in Massachusetts,” the panelists, Tim Rowe, founder of the Cambridge Innovation Center and Scott Kirsner, a Boston Globe reporter, led a discussion on how to make the Boston entrepreneurship ecosystem stronger. The panelists and audience members were surprised by his announcement, but offered to support Evanish—if he could launch the site by the following week. Evanish, who was studying for his Master’s in Technical Entrepreneurship at Northeastern University, sprung to action. Grabbing his friend Ashkan Afkhami, also a Northeastern student (making up the second half of the “we’re,” that Evanish promised would create the website), the pair began producing what would later be known as Greenhorn Connect. Afkhami and Evanish had previously teamed up to create a wiki, or an online collaboration space, to figure out what was going on within the Boston entrepreneurial ecosystem, a system that remained confusing to many entrepreneurs. The wiki listed and categorized events happening in Boston for entrepreneurs and individuals interested in the startup community. The final product evolved out of this wiki, becoming a full-scale website available to the public. Greenhorn Connect launched on Oct. 13, 2009, and has been expanding based on the entrepreneurial community’s needs ever since, Evanish said. Though Afkhami has since left Greenhorn to concentrate fully on his own startup company MobiquityInc, a mobile computing professional services firm based in Boston, Evanish has continued to work on Greenhorn Connect in addition to his fulltime job, and brought on board both Ian Stanczyk as product manager and Pardees Safizadeh as social media director for the site. The website consists of resources and news for entrepreneurs, a job board for startup companies and those seeking positions within startup companies, and an event listings board that describes what events are going on in the Boston community each month, accompanied by a summary each week highlighting the most valuable events individuals can go to each week. On Tuesday, I went on my very first class trip of my college career. As a junior, I didn’t really think class trips still exist, but fortunately in Professor Kennedy’s class, they do! Where did we go, you may ask? Well, I’ll tell you. 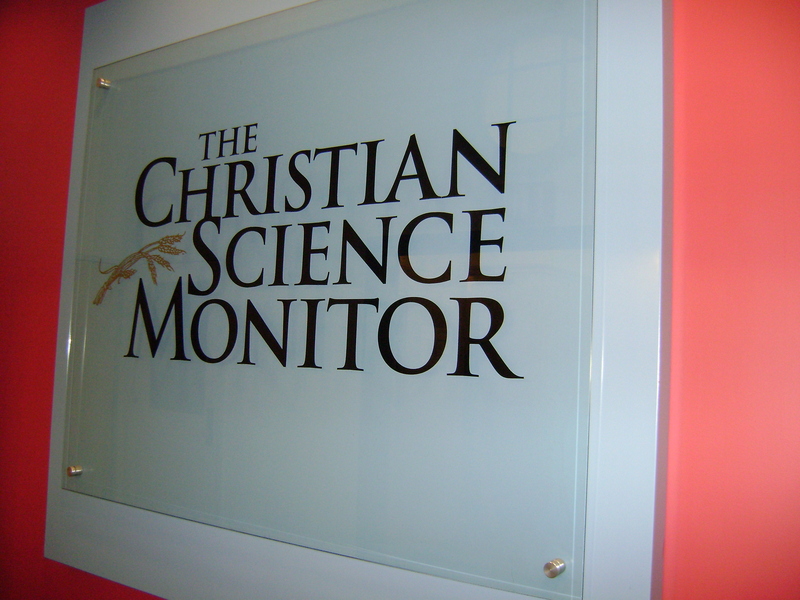 We ventured a whole ten minutes away from the university and went to the Christian Science Monitor buildling on Massachusetts Avenue. 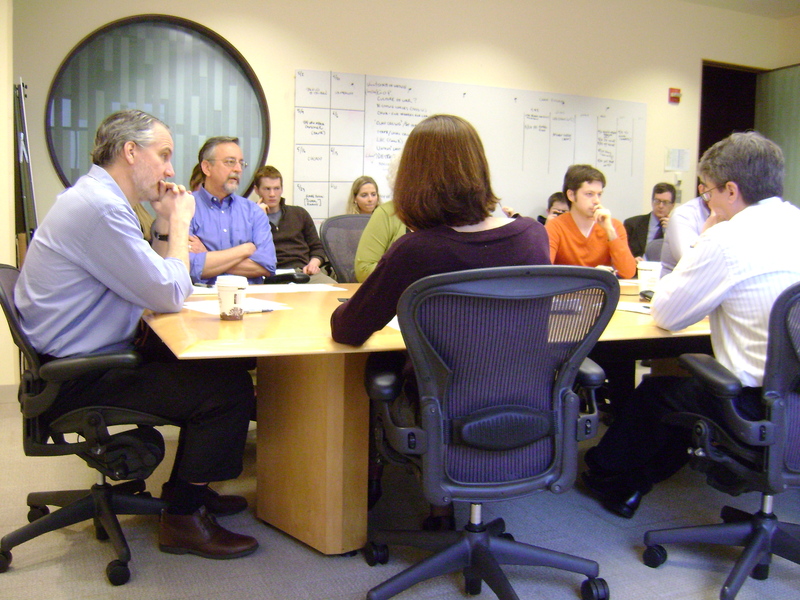 We got to sit in on a morning meeting with the editors (cool! ), explore the newsroom and ask a bunch of questions about the way the Monitor has evolved from a print edition published five days per week to its new, online-first model (The Monitor is still published in print weekly). Getting to sit in at the morning meeting was definitely the coolest part of the trip. However, a morning meeting of editors was different than I thought–there was no urgency, no running around or hustle-and-bustle of a newsroom you sometimes see on television. But it was definitely interesting to hear what goes down at this type of meeting, such as discussing the stories they would be writing throughout the day and when it would be featured on the website. The editors and reporters also talked about what they would be putting on the “top left” of the site, or the articles that are featured most via Google. Editor John Yemma talked about how their online readership has grown six-fold since they switched from a daily publication to an Internet-first model, as well as the need for audience participation on the website in forms of quizzes and picture slide shows to encourage audience engagement and interest. See more photos from our class trip here! On April 6, I attended DemoCamp Boston at the Hult International Business School in Cambridge, Mass. What should entrepreneurs know, you may ask? Media coverage is really fun, but also a huge distraction. Representatives from startups peerTransfer, Rate It Green, InstantNightlife, DailyFeats, Innovation Nights, Embed.ly and Vizibility all had five minutes to present their venture, business plan and main goals and then had the chance to receive five minutes of feedback from the audience. After advice, critiques and ideas were exchanges, participants and audience members had the chance to stay, eat, drink and network with one another (which nearly everyone took advantage of). Mariana Espinosa Kicked Off DemoCamp Boston with Hult dean Henrik Totterman. Click the photo for more. The most interesting startup presented (in my opinion) was Vizibility, a company that uses SEO to enhance your visibility through Google searches. As a junior in college getting ready to apply to full-time jobs next May, I think this way of curating a top five list of Google links for myself would be a great way to help our future employers, as well as weed out any “bad” or “unhelpful” links individuals may get when they Google my name. Last week I attended an event at the Holt International Business School (which I will elaborate on more during a future post), where several startup company representatives had the opportunity to present their startup business and ideas to an audience of other entrepreneurs and those interested in entrepreneurship. After a five-minute presentation, the audience was allowed five minutes of questions and feedback, giving the lineup of presentations a collaborative element. One startup I found particularly interesting was InstantNightlife (INL), a new mobile application founded by two MIT students who wanted to make going out easier for people in Boston. While “going out” is supposed to be just a fun time, it can wind up being stressful if you don’t know where to go, end up waiting in line or are trying to meet up with your friends or a large group of people. InstantNightlife aims to reduce all these stresses and bring you back to just having a good time. What does it do? Basically, the mobile app (available for any smartphone users) allows users to see the current status of several popular Boston clubs before heading there, such as how long the line is and the girl-to-guy ratio once inside. App viewers can also find out if the dance floor will be packed once they get inside, and find out about real-time deals that only those with the app have access to. A bar can be a fun scene or a boring scene on any particular night, so it’s important to know what is going on at the venue in real-time. Users can also interact via the application: You can find out where your friends are, and even buy or send them a drink if they at the same club as you. The only problem is getting everyone to use smartphones. I personally don’t have one, so this app is a bit useless to me. However, I still think it’s a really cool idea and great mobile application that tons of college students and young professionals would want to use. The only critique is that the bars the app features right now all seem a bit pricey, and some college students just don’t have the funds for that. To learn more, check out the InstantNightlife website, download the application for free, OR read this article from BostInnovation.